The new Flood Insurance Rate Maps for Franklin show the reach of the Special Flood Hazard Zone (a.k.a flood plain) according to the Flood Damage Prevention Law, passed at the April Town Board meeting as Local Law 2012-1. Our one flood plain extends from the East Sidney Reservoir up the Ouleout Creek to just above Chamberlin Hill Road, up Treadwell Creek as far as Jackson Hill Road, and up Handsome Brook as far as the fork of East Branch and West Branch. This plain is defined as having a one percent chance each year of being flooded to deeper than one foot, and it marks what is commonly known as a hundred-year flood plain. (The span between the last two hundred-year floods in this plain was 51 years – August 1955 to June 2006.) This 2012 flood plain covers more land than the older version and allows more landowners to get subsidized flood insurance. At its widest, above the reservoir, our flood plain is over 3,000 feet across. These maps mark the boundaries in greater detail than the old maps, which date from 1987, 25 years ago. Because of this detail, ten maps are needed to cover the flood plain in Franklin at a scale of 1”=500’ or 1”=1000’. The more detailed maps are for the area around the Village. These federal maps (Exhibit 2) are available for viewing at the Town Hall, as is the accompanying report: Flood Insurance Study, Delaware County, New York, All Jurisdictions, Volumes 1 to 3. The report runs only 76 pages, but the accompanying flood profiles (Exhibit 1) run 163 pages. None of these profiles are for flooding in Franklin. Construction within the flood plain must follow specific codes, and the plans require a Flood Plain Development Permit. Our code enforcement officer has been appointed the Local Flood Plain Administrator. Our new law adds a fee of $5 for this review, whereas Walton set their fee at $150. The ordinance was written by the Delaware County Planning Department. Franklin passed the minimal version of the law (as recommended by Planning), unlike towns such as Hancock. Therefore our code enforcement officer will not be required to inventory all existing buildings in the flood plain. At the April meeting, Duncan Martin of the Delaware County Planning Department answered questions. Unless the minimum was adopted, Franklin would not have been eligible for FEMA reimbursement and landowners would not have been eligible for the National Flood Insurance program. All of the flood plain in Franklin is zone A. New maps and fee went into effect June 19th. In the last few months, everything has changed – but in reality, nothing has changed. The Tennessee Gas Pipeline Company seems to have dropped its Northeast Extension Project, after the partnership of Williams and Cabot announced their Constitution Pipeline. Instead of moving the gas from the Tennessee #300 pipeline, the gas will come from the Williams Transco Pipeline further to the south. The Northeast Extension would have been a 36” pipeline, whereas Constitution will be 30” – one third smaller. To move the same amount of gas through a smaller pipe, the pressure will be higher: 1480 psi. 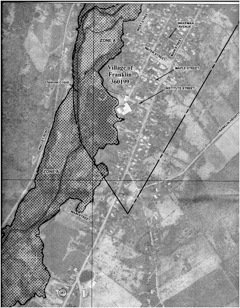 A major pipeline will still run through Franklin (see map at right). The gas will still come from the Marcellus gas fields of Pennsylvania. This gas will be delivered to the intersection of the Tennessee #200 and the Iroquois pipelines in the Town of Wright, Schoharie County, and from there moved on to New England or the New York Metro area. Construction is still scheduled to begin in the spring of 2014 and finish in less than a year (see Timeline: Constitution Pipeline). No other details were provided by Richard Wheatly, Manager of Media Relations. All this is despite El Paso having presented the Northeast Extension at least since September 2009, whereas Williams first presented the Constitution in February 2012. The Constitution Pipeline repeats the Marcy South power line experience in that hundreds of land owners in Delaware County will lose control of parts of their property for inadequate compensation — even though the project is of little benefit to residents. Unwilling owners will be compelled through eminent domain. The pipeline would be almost 121 miles long, with the right-of-way cutting through an estimated 1,400 properties. Of those, 1,100 are in New York State, 500 of which are in Delaware County, and 120 are in the Town of Franklin. The Cornell Cooperative Extension of Delaware County hosted two meetings on the pipelines on the17th of May. At the meeting in the Franklin Central School, representatives from Williams did not answer why the Constitution Pipeline could not be routed along the I-88 right of way (ROW) for over half its length, thereby sparing hundreds of local landowners. In April, Williams began sending letters to landowners along their preliminary route, requesting permission to trespass for survey work. Separately or together, land, engineering, environmental, and possibly cultural surveys will take a day or two each and leave stakes and a cleared line-of-sight along the route. If this permission is not granted, then Williams could obtain a court order to force the issue. However, the permission granted by the landowner need not follow the Williams document exactly. Other such documents give more protection to the landowner and fewer rights to Williams. By fall, Williams will have firmed-up the route of the pipeline, and then it will be seeking easement agreements from landowners. Owners should be compensated for: permanent loss of the use of the ROW, inconvenience during construction, complications from dividing a property in two, loss of the value of the whole property, rental of the land to ship gas, and future rights to the easement. Other costs should be assumed by Williams in the easement agreement, such as contingent liability and the cost of removing the abandoned pipeline. Along pipeline routes in northern PA and the Millennium in NY, the landowners have been paid $5 to $25 a running foot. Use of the surface ROW alone is valued at a fraction of the fee simple (purchase price) of vacant land. In Franklin, for a corridor 50 feet wide, that works out to about $1 per running foot of easement. Although a corridor up to 125 feet wide will be cleared, Williams’ control of the wider strip ends with the completion. In addition, landowners should be paid for “damages” such as structures knocked down, timber cut, and crops that could not be grown during construction. In the ROW, no permanent structures can ever be built: no house, garage, deck, patio, or septic system. Nor can the landowner plant trees or even tall shrubs. Nothing can be built that interferes with Williams’ ability to monitor the pipeline and dig-up the pipe if necessary. However, the owner must still pay taxes on the acreage in the corridor. Other than walking, mowing, and watering, anything that you want to do on Williams’ easement requires their written permission. The landowner must submit plans to their engineering department. After a few weeks a letter will be sent prescribing what Williams will allow. You may only begin work once this letter has been signed and returned. The boiler plate contract from most companies would allow more than just the pipe under their easement. While the pipeline is mostly buried, there are small surface facilities such as valves, metering and regulating stations, and equipment launch and retrieval ports. These fit entirely within their easement and are surrounded by a chain link fence. A pipeline ROW also enters the land owner in the lottery to have a compressor station for a neighbor. The plan that Williams has submitted includes only one compressor station at the northeast end. However, even at 32,000 hp, this is not enough to move gas through the pipeline at full capacity. Additional compressor stations can (and likely will) be built along the line. In recent years, pipeline companies have left these booster stations out of the pipeline project, possibly to reduce local opposition. For example, the Millennium Pipeline is only a few years old, but already a compressor station is being separately certified for town of Minisink, Orange County, and the company has selected the site for a second in town of Hancock, Delaware County — only 60 miles away. Williams will not deny that compressor stations may be built but only repeats that none are in their current plans and additional FERC permission will be required. In the boiler plate agreement, there is no clause for rental payment. The Constitution Pipeline is designed to carry 630,000,000 cubic feet each day beneath your feet. Williams will charge companies of Cabot Oil & Gas and Southwest Energy a fee for every cubic foot, but the land owner receives nothing. Again, the land owner has no choice but to reach some sort of agreement with Williams. Once FERC awards a Certificate of Public Convenience and Necessity (targeted for November 2013), Williams gains the power of eminent domain to seize any easement. However, the agreement does not have to be the boiler plate version that the landman will first offer. These versions give every advantage to the company. For example, they typically give a company all rights to future use of the easement for additional utilities such as communications, power, and even additional pipelines – all without additional payment to the landowner. The landowner comes to the negotiating table with a weak hand. The owner is a novice while the pipeline company has been doing this for decades. Most likely, this will be the first time an owner has seen an easement agreement for a pipeline, whereas the company knows not only what every word means but understands how the court would interpret anything not specified. Utility projects are inherently unfair in compensating a landowner, but they can be made less unfair. By banding together to form a coalition, landowners can pool information and resources, and negotiate the best possible deal for themselves. The proposed Constitution Pipeline would carry gas from the Marcellus gas fields of Pennsylvania to the intersection of the Tennessee #200 and the Iroquois pipelines in the Town of Wright, Schoharie County, NY. …or live to regret it? A short while ago, I drove down Route 17 to Middletown, NY, in order to meet my daughter at the train station there. Route 17 is being “upgraded” to Interstate 86 at a cost of who knows how many gazillions of taxpayer dollars. According to the New York State DOT website, the construction budget for the sections of road between Roscoe and Middletown is just under $165,000,000. That includes $96,626,000 to build a bypass at Parksville, no doubt devastating that village’s restaurants, gas stations and other businesses, and cutting the State’s tax revenues from that soon-to-be-shuttered community. “What were they thinking?” I wondered as we drove along. Why are the bought-and-paid-for idiots who spend our money dispensing hundreds of millions of it for yet more paved highway that in a few short years no one will be able to afford to drive on and which the State will be unable to maintain? Global production of oil peaked in 2008 and we are now bouncing along on a very bumpy production plateau, at the end of which is not “energy independence” but a cliff. Like Wile E. Coyote, we are going to shoot out over that cliff and pedal frantically in mid-air for as long as we can –– until we can’t. When we hit bottom, we’re going to find ourselves in a much simpler, less energy-intensive world than any of us have experienced in a very long time, a world in which shoe leather will be more valuable than a set of wheels that you can’t afford to run. Don’t believe the hype about shale gas replacing imported oil. You’ll notice that the drilling companies run trucks, bulldozers, drilling rigs and compressors on diesel fuel, not shale gas. It is liquid fuels that make our economy go. The drillers operating in Pennsylvania are all losing money on the gas they produce. They keep at it to keep their stock prices up while they try to arrange for a pipeline to take the gas to Boston where it can be liquified and sold to the allegedly expanding economies of Asia. Unfortunately for that plan, the Chinese and Indian economies are contracting, in step with the markets in the US and Europe. Let’s also remember that the State and Federal governments are broke and running on borrowed money––on debt. Projects like the insane conversion of adequate Route 17 into economy-destroying Interstate 86 are funded with bonds, which sounds respectable and responsible until you examine it. The State agency issues bonds which “investors” buy and on which you and I pay the interest (mostly to the same banks that are still on taxpayer-funded life-support). When those bonds mature, the governments (who have no money with which to repay the principal) “roll over” the bonds into new bonds on which you and I continue to pay the interest. But, since the day when the original bonds were issued, more money has been borrowed in the form of additional bonds, on which you and I pay the interest as well. One day, the amount of interest due on all the accumulating bonds will exceed all the income earned by everyone in the state or the country and, on that day, the whole Ponzi scheme collapses. Perhaps you’ve noticed that Europe is currently imploding for exactly this reason: unrepayable debt. The only reason that the United States is not also falling apart is that, for now, we are perceived as a safe haven by those who are fleeing the Eurozone. The dollar is still the internationally accepted reserve currency which everyone needs to buy food and fuel. One day soon, however, the interest payments on the loans to our government will exceed our income and then we’ll be busted, too. We are clearly in a serious predicament. Our politicians, alas, either don’t understand or don’t acknowledge the seriousness. They lie or inadvertently misinform about energy, about money, about debt. So what can we do? Let’s go back to Wile E. Coyote, bruised and angry at the bottom of the cliff. Like Wile E., we pick ourselves up, dust ourselves off and (perhaps groaning with pain and disappointment) go on with the rest of our newly very simple lives. What we really need for a decent life is suddenly very clear: not a smart phone and American Idol but food, shelter, clothing, family, friends, and a community within which to find, produce, grow and nurture those same things. In Franklin, as in every community in the modern world, we have all grown more separate, more selfish, more isolated in our homes and our private concerns. We need to stop fantasizing about a future that, no matter how much we wish it would be, will not be like the easy past. The sooner we simplify our lives and relocalize our economies, the easier will be the inevitable transition.